UNITED NATIONS/PORT-AU-PRINCE, Oct 31 2013 (IPS) - Some 2,400 kilometres from New York City, where victims of Haiti’s cholera epidemic are suing the United Nations in a U.S. federal court, the disease continues to burn through the populace with no end in sight. In a single week between Oct. 19 and Oct. 26, the Pan-American Health Organisation reported 1,512 new cases and 31 deaths. New cases are reported in all 10 departments. At the Cholera Treatment Centre run by Médecins Sans Frontières/Doctors Without Borders in Delmas 33, a commune in Port-au-Prince Arrondissement, nurse Viola Augustine says the clinic is so packed it cannot accept new patients. Felicia Paul, 45, lives in Saint-Marc, about 100 kms northwest of the capital. She caught cholera in 2010, and survived it though extensive treatment with saline IV bags. “I was infected with cholera for 12 days,” Paul told IPS. “My two daughters caught it while they were taking care of me. MINUSTAH brought cholera so we ask that they compensate me. We always drank water out of the river and it never made us ill. But that water has been contaminated due the spillage of the peacekeeper’s feces into the river. Breaking from the U.N.'s official position, U.N. High Commissioner for Human Rights Navi Pillay argued during a speech at an awards ceremony in Geneva on Oct. 8 that Haitian cholera victims should be compensated. “I have used my voice both inside the United Nations and outside to call for the right — for an investigation by the United Nations, by the country concerned, and I still stand by the call that victims of — of those who suffered as a result of that cholera be provided with compensation,” she said. Asked for a response, U.N. Associate Spokesperson Farhan Haq told reporters the role of the U.N. High Commissioner for Human Rights is to stand for the rights of victims, and her comments should be understood in that context. “As the legal process is under way, we cannot make any further comment on this particular situation,” he added. A former senior U.N. official from Nepal told IPS he strongly supports compensation. “As a Nepali who lived in and loved Haiti, I feel special empathy for the victims of the cholera epidemic,” said former U.N. Assistant Secretary-General Kul Gautam. In a way, he said, even the Nepali peacekeepers are victims of the kind of poverty and poor governance that afflicts both Nepal and Haiti. The two nations are categorised by the United Nations as among the 49 least developed countries (LDCs), described as the poorest of the world’s poor. None dispute that the lack of clean water and sanitation in Haiti has been a key driver of the epidemic. “I wish a creative solution could be found whereby the Haitian victims would get some modest amount of financial support on humanitarian grounds, without the U.N. having to give up its diplomatic immunity,” Gautam said. “For this to happen, some enlightened governments and foundations would need to offer help, not as a matter of legal obligation, but as a matter of humanitarian consideration,” said Gautam, a former deputy executive director of the U.N. children’s agency UNICEF. Mario Joseph has been the director of Bureau des Avocats Internationaux (BAI) since its inception in 1995. 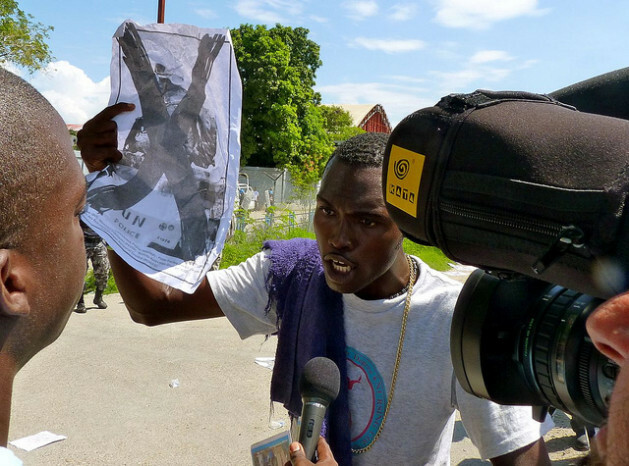 BAI, together with the Institute for Justice and Democracy in Haiti, is leading the lawsuit. “The trial is proceeding normally like any other trial,” he told IPS. “We’ve taken the first steps with the U.N. to bring them to take responsibility. To submit our claim, we sent the case to [Secretary-General] Ban Ki-moon, but unfortunately, the U.N. said it was protected by immunity. “The U.N. experts have clearly established that it was the Nepalese peacekeepers who brought cholera to Haiti. It is clear that damage has been caused, the negligence of the U.N. is proven and it must assume its responsibilities. “An organisation like the U.N. should not exercise a policy of double standard for evaluating itself vis-à-vis its member states. Haiti is a founding member of the U.N. In this sense the organisation must assume its responsibility concerning the cholera it brought into the country,” he said. U.N. Spokesperson Martin Nesirky says the U.N. remains committed to do all it can to help the people of Haiti overcome the cholera epidemic. “The United Nations is working on the ground with the government and people of Haiti both to provide immediate and practical assistance to those affected, and to put in place better infrastructure and services for all,” he told a press briefing this month. Kanak Dixit, a veteran Nepali journalist and a civil rights activist, told IPS the fact that the epidemic has been traced to likely contamination of water sourced to the Nepali peacekeeping battalion is a matter of great consternation. Nepal is heading into elections on Nov. 19, and the news has not received much attention there, nor has there been public discussion on the matter, he said. “It would be extremely sad if it were true that a poor country in one hemisphere has been involved in the spread of the epidemic in an equally poor country in another part of the globe,” said Dixit, founder of the news magazine Himal SouthAsian. He said it should be the collective duty of the United Nations to support the Haitian people in battling the epidemic, and supporting the victims’ families, rather than take a legalistic and hands‑off approach. “Nepalis would understand the need to respond to the epidemic with humanitarian ethos and organisational efficiency,” Dixit said. Nurse Augustine agrees. “For a disease like cholera that has led to so many victims, I think the United Nations should compensate those who have suffered because the illness is truly horrible. This is such a sad situation. Haiti was the poorest nation anyway, but since it was hit with catastrophic weather where housing, stores and the like were wiped out, leaving untold deaths, bodies not found, the Haitian people face: no food, no clean water, and no homes each and evey day. On top of that, they lack medical supplies to treat most illnesses. I remember donating to the Haiti relief fund, and I keep up with the various Christian ministries that are on the scene doing any and all tey can to keep children alive, to provide food, etc., I am now involving myself in the Haitian crisis. How many grandparents can remember the plagues that hit Europe? If they do remember how tragic those incident(s) were, then they should know all too well what the Haitian people are up against. I think Haiti needs to come to international attention again in which the greatest needs in Haiti are outlined. There are many American philanthropists who could/would donate to a cause such as found in Haiti.